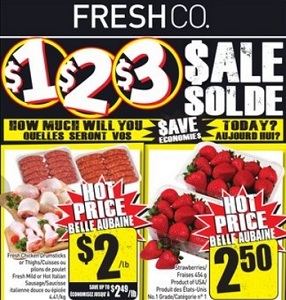 Freshco Flyer January 7 – 13, 2016. Sale! 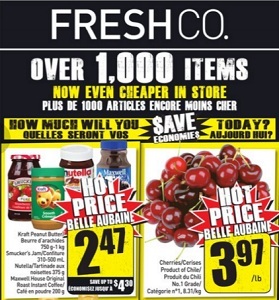 FreshCo, a Canadian chain of discount food stores owned by Freshco Inc. was launched in May 2010. The first eight FreshCo stores were launched on May 12, 2010 in Brampton and Mississauga, Ontario. 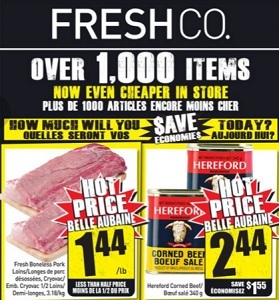 By April 2012, FreshCo managed to expand all over Ontario with 68 stores. FreshCo also goes by the reference “Fresher, Cheaper.” If customers are not satisfied with the freshness of the product they are given the right to refund their money. Based on the information given by Freshco former president and CEO Bill McEwan, the creation of FreshCo offers customers with fresh food at discount prices in a modern shopping setting. For the most part FreshCo stores were renovated and converted from Price Chopper stores. There are a handful of FreshCo stores which were newly built, or converted from other retailers. FreshCo is considered to be a new brand and not just a conversion from Price Chopper. Price Chopper had opened in Ontario in the 1990s. Owned by Freshco, 87 Price Choppers were scattered around many low-income neighborhoods in Ontario. It was opened in Ontario in 1998 under the ownership of Oshawa Group. Freshco replacement of FreshCo for Price Chopper has exceeded many customers’ expectations. FreshCo aims to deliver a diversity in ethnic products instead of the typical grocery shopping experience. Understanding that each community is unique, FreshCo products reflect the community in which they operate. The store is organized to fit customer’s needs. The extensive frozen and chilled ethnic-items in the front, with the organized alignment of produce aisles called the “Fresh Hall,” surrounded by fresh products, moving onto local baked goods which are baked daily from community bakeries. Further onto the store, customers are presented with a wide variety of Ontario cheeses and meats where later it moves on to a feature aisle with special savings opportunities for the customers. 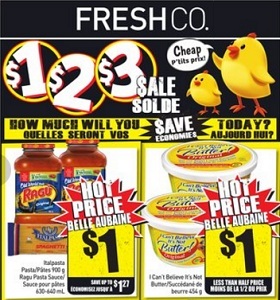 In 2012, Price Chopper was facing increased competition from Loblaw Companies, which was opening more No Frills discount grocery stores in Eastern Canada. Freshco closed some Price Chopper stores in the Atlantic Provinces, or rebranding them to its Foodland banner. 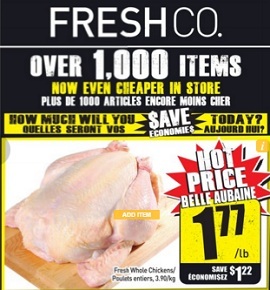 On yFlyers.com you will find the latest Freshco flyer and weekly specials, online, on a single place.